I was going to write about pizzas but I have been distracted by a film on television, Die Hard . It made me think that it is a sad fact, but true, that a small minority of people can watch Arnold Schwarzenegger (or whoever it happens to be) shooting somebody in the face with a big gun without appreciating the underlying philological complexities. Once upon a time, in 1702, a chap called William Coward wrote a book called Second Thoughts about the nature of the soul. The point at issue was the soul in Hell. If Hell is purely physical suffering (flames, pitchforks up your bottom etc) then how does a metaphysical soul suffer? Moreover, what about people who can take physical suffering? What about people who laugh at pain? Presumably, they’ll be tough enough not to mind Hell. …he urges the Case of those that die hard, as they call it, at Tyburn ( an area in London where hangings took place). Thus the phrase became famous and was taken up by all and sundry, especially conservative political factions who used it as an adjective. Those Tories who opposed Home Rule at the beginning of the twentieth century were die-hard conservatives. All it then required was for Alan Rickman to put on his British/German villain accent and the rest is cinematic and linguistic history. 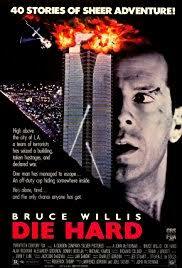 I don’t know where Bruce Willis stands on the nature of the human soul. I should like to know what he thinks, but Mr Willis maintains a sphinx-like silence on the matter. Previous PostTexting and bunga bunga….